Notes: Opened as Bury Lane this station was one of the original passenger stations of George Stephenson's 1830 Liverpool and Manchester Railway the world's first railway to cater for passengers as one of its primary functions. It was also arguably the worlds first inter city railway. When the line first opened on the 15th September 1830 no details exist of the initial intermediate stops and Walkers accurate description of the line at the time of opening says that fares for intermediate stops had not been settled implying that initially there might not have been any stops. There were many early changes of stopping place and name so the early history of intermediate stops is patchy. At first trains stops at, for example, level crossings where the gatekeeper issued tickets; perhaps a room in his cottage was available as a shelter. Many of the stations consisted of little more than a basic cottage. In 1841 platforms and nameboards were added to stations lacking them. Certainly by the end of the 19th Century Bury Lane had been developed into a two platform station with staggered platforms and fairly simple LNWR style wooden booking and waiting facilities. It was renamed as Glazebury and Bury Lane in July 1878. From the beginning the station would have been served by local trains running between the two cities or on shorted journeys. A steady stream of express and goods services would have passed through. 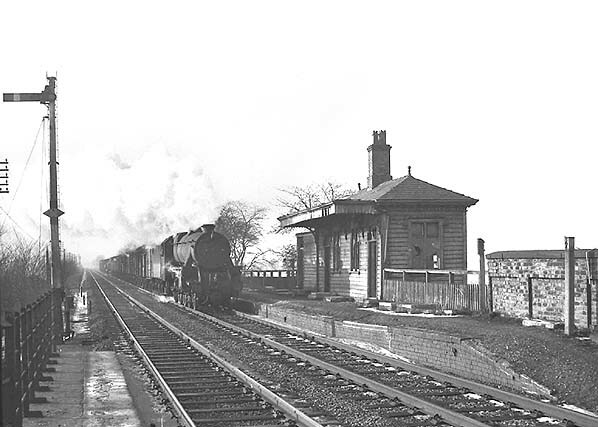 The 1830 Liverpool to Manchester line is still a busy railway but over the years many of its intermediate stations, including Glazebury and Bury Lane have closed to passengers. Glazebury and Bury Lane was closed on the 7.7.1958. This 1952 map clearly shows the memorial at the site of the first Parkside Station and a similar sized structure at the site of the second station. 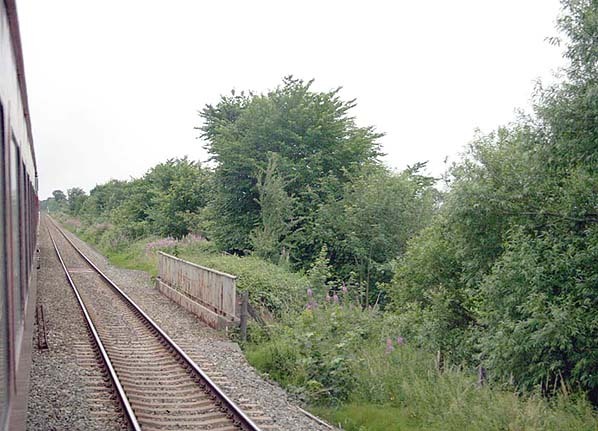 The site of Glazebury & Bury Lane Station looking west (Manchester platform) in July 2006. Taken from a similar viewpoint to the picture above.